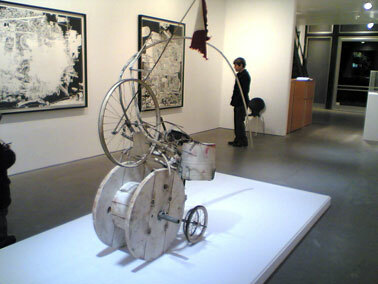 Michael Landy: H2NY is a pseudo-documentation of the mad-scientist Jean Tinguely’s big hurrah at the Museum of Modern Art in 1960, Homage to New York, a machine which was supposed to self-destruct but didn’t quite finish the job, instead spitting fire and wild jerks of movement until firemen put it out. 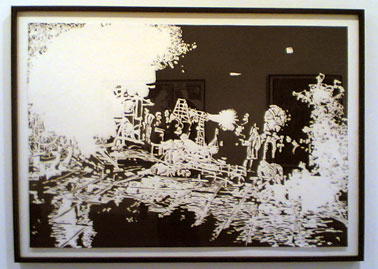 Landy, with a gifted illustrator’s touch, makes loving drawings of the machine in all its permutations. Full of detail and charm, each drawing is a hip surrealist throwback into the winking-eyed vintage postmodernism of Tinguely’s aesthetic. Adding to the Museum of Jurassic Technology-like artful reframing of history, remnants of Tinguely’s machine sit primly in the center of the room as if to say, this happened and kiddo, you missed the show.